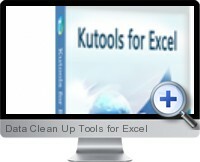 Data Clean Up Tools for Excel (KuTools) is designed to facilitate the clean up of data in Excel by automating tasks such as removing blank cells, applying coherent names and merging data. Furthermore, the data clean up tools can be applied to multiple workbooks for batch processing. Maximize Workspace - a set of four options to automatically customize the workspace options in order to maximize the working area which can be toggled on/off as desired (Options: minimize the Ribbon, hide the status bar, hide the formula bar, and hide the Ribbon). Workbook Manager - Merge multiple Excel workbooks, split the current workbook or automatically filter blank and hidden worksheets. Worksheet Manager - Sort worksheets of the current workbook in alphabetical order, batch rename worksheets, batch copy worksheets or delete empty worksheets. Common Tools - Complex calculations, current file path copying, file backup, open containing folder, and auto open current workbooks. View Tools - Show or hide the Ribbon, vertical or horizontal scroll bar, sheet tabs, status bar and zero values. Visibility Tools - Hide inactive workbooks and worksheets, or show hidden ranges, workbooks and worksheets. Delete Tools - Delete specific objects from the current worksheet such as charts, pictures, lines, shapes, OLE objects and linked OLE objects.